Find a way to prevent demolition dust from migrating to areas where it might get sucked into jet engine intakes or create a nuisance or potential health issue for the approximately 100,000 passengers who travel through the airport each day. The solution had to be more effective than traditional hand spraying techniques, without producing a large amount of standing water. 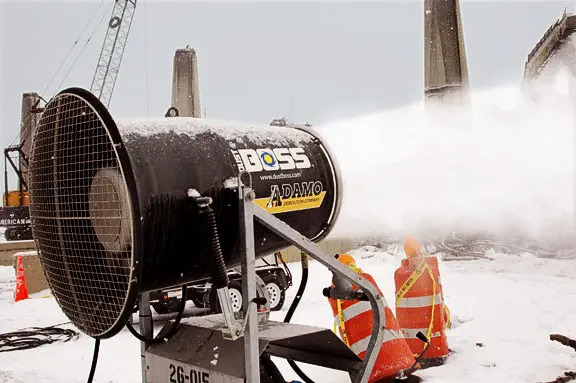 The two DustBoss units were focused on the demolition area at all times, even when wind chills reached zero, efficiently knocking down airborne particles and driving them to the ground. The technique proved to be so effective that Adamo crews did not receive a single dust-related complaint during the entire demolition of the large terminal structure. When Adamo Demolition was contracted to take down the James M. Davey terminal at Detroit Metropolitan Wayne County Airport (DTW) to make way for a new and larger terminal complex, they knew it would require some dexterity. A primary goal was to ensure the least amount of disruption possible to air traffic and services to the 100,000 travelers who pass through the busy airport on an average day. From the outset, company engineers knew that with the size of the structure and the confined working space, they would need to take additional measures to control dust. It was critical that the demolition process not allow large amounts of dust to migrate to nearby runways or taxi areas, to prevent tiny abrasive particles from being sucked into jet engine intakes. In addition, crews needed to confine the dust to the demolition area to prevent it from drifting across roadways or into the remaining terminals, which might contribute to visibility problems, health concerns or cleanliness issues. One of the reasons hand spraying can't suppress dust is that it creates water droplets far too large to efficiently trap airborne particles, limiting its effectiveness to surface wetting. Hoses and sprinkler nozzles often produce droplets that are 3,000 microns or larger in size. The optimum size is between 50–200 microns, so that the droplets and solid particles have the greatest chance of colliding. The DustBoss 60 (DB-60) is designed to create a massive volume of those optimized droplets and throw them great distances before they settle to the ground. That means engineering not only the size of the atomized drops, but also the spray pattern and velocity to deliver the right balance of coverage area and hang time. 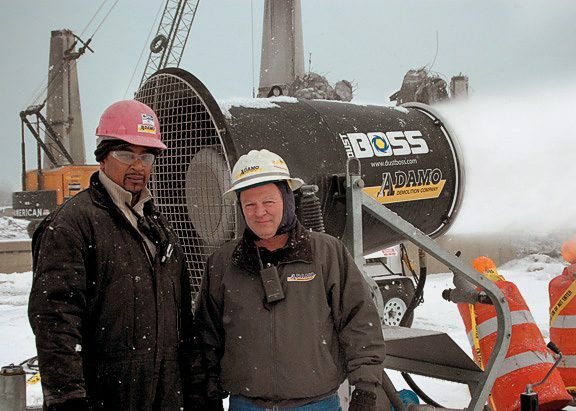 Susalla and his men worked long days during the demolition and material removal, and the crews had two of the oscillating DustBoss units running virtually the entire time, even when temperatures dipped below freezing and the wind chill dropped to zero. The operators and site superintendents were extremely satisfied with the results. The effectiveness of the DustBoss also eliminated dust-related health or safety concerns at the airport. The new $418 million terminal at DTW is now open, adding 26 new gates and providing a home to such scheduled carriers as Air Canada, Air Tran, American, Frontier, Southwest, Spirit, United, USAirways / America West and USA 3000, as well as 30 new shops and restaurants. Demolition dust suppression: Rent or own? This entry was posted in DB-60, Demolition, DustBoss, News. Bookmark the permalink. Both comments and trackbacks are currently closed.